The style of service is a major factor to consider when planning an event, function or dinner. Often the style of service will influence the types and varieties of foods the caterer can offer. For instance, foods that will be passed on trays by servers during an afternoon reception must be easy to pick up in fingers and eat in one or two bites, and not require a sauce (in order to reduce the drip factor). They also must be able to hold up well because it may be that the tray is being passed for 10 minutes or so, if the gathering is on the large side. Typically, chefs at Intertain plate dishes for individual service, however if a client has opted for a canapé option, the selected dishes will be passed around on platters. One of the benefits of using Intertain is the customisation of the meal and service styles. We will work with you to find the best fit for your dinner. Food is arranged on tables along with plates, cutlery and condiments. Guests are invited to move along the buffet line and serve themselves before returning to their tables to eat. A very elegant buffet would have servers to carry guests’ plates to their tables for them. Finger food and canapés are arranged on to trays in the kitchen and passed out by servers. Guests are able to pick what they would like to sample, as and when a server is in their vicinity. This type of service could span the entire function or merely accompany pre-dinner drinks before guests are seated more formally – depending on the event. Similar to a buffet, where diners stand in line, but do not help themselves, rather they indicate what dishes they would like and are served by chefs and/or servers from behind the buffet line. This is an excellent way to control portion sizes along a buffet style table. Sometimes dishes like salads, bread rolls etc. will be self-service (and re-fillable), and an attendant will serve the premium dishes, such as meat items. Guests are seated at a table. Dishes arrive at the table in large serving platters and bowls. Guests are able to help themselves by passing the dishes around, or occasionally with the help of a lazy Susan. Joints of meat are often carved at the table by the host. Guests are seated around a table and there is one server for every two guests. All guests at a given table are served at precisely the same time. Servers wear white gloves. Foods are plated in the kitchen before being covered with a cloche (the dome shaped covering often used in fine dining). Each server carries two servings from the kitchen, and stands behind the two guests assigned to him or her. At the direction of the head server or maître d’ hotel, and with precise synchronicity, the dishes are set in front of all guests, and the cloches removed. This procedure may be followed for all courses. A selection of pre-plated foods, such as pastas, sandwich and/or salad plates are set on a buffet table. They may also be placed on a roll-in cart and then moved into the function room at a designated time. This is a particularly good idea for groups who want fast, easy to manage meals, for example during breakout groups when the idea is to have a ‘working’ meal. 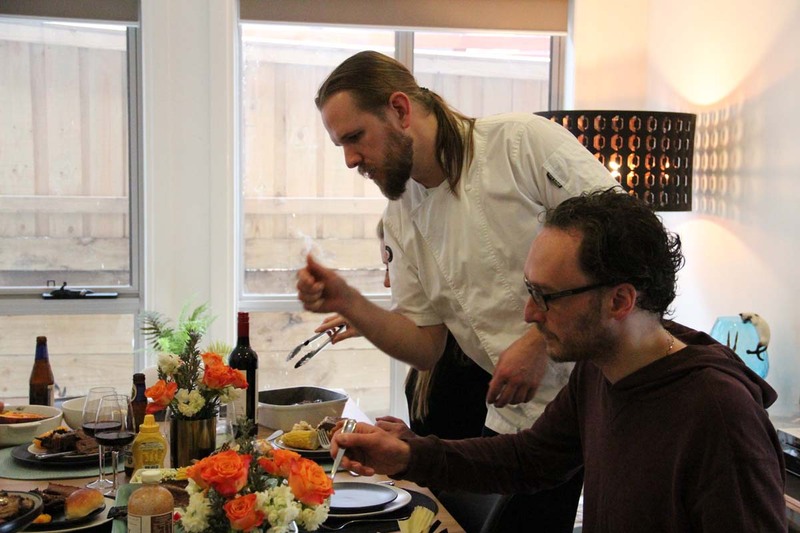 Guests are seated and dishes are plated in the kitchen, before being served by servers. Meals are served from the left, beverages are served from the right and dirty dishes and glasses are removed from the right. This is the most functional, economical, controllable and efficient type of service. For this style of service, food is already set at the diners’ places when they are arrive and are seated. Since pre-set foods will be on the tables for a few minutes before they are consumed, the chef and staff must ensure that the dishes served are appropriate, will remain not only food safe but appetising in the situation. The most common pre-sets are bread and butter, but occasionally the entrée will be pre-set as well. Guests are not seated and are free to move about the space. The food is served buffet style and guests serve themselves. The style of food reflects the nature of the event - often referred to as “walk and talks” – with nothing that might require cutting. This is a 'quick and dirty" method of serving where all servers start at one end of the function room and work straight across to the other end. Servers are not assigned workstations. In effect, all servers are on one team and the entire function room is the team’s workstation. The wave is typically used in conjunction with plated and pre-set service styles as it lends itself to large functions. Guests are served very quickly, yet impersonally as this style of service does not allow for individual service for guests. The style of service is a major factor to consider when planning an event, function or dinner. The number of guests, the dining room, timing and desired menu all work together with the style of service, the service staff and the chef/s, to ensure a successful event. It is possible to mix and match service styles as need be, for instance for variety, you can mix service styles during a single meal function. For instance a client may with to have a reception style event where guests enjoy drinks whilst mingling, and the appetisers and/or entrées are served by wait-staff, before the guests are led into a dining room and seated for an American style plated service. Or a plated service event my finish off with a buffet style dessert and tea/coffee station. Whatever your next event, Intertain’s experienced chefs and staff will help choose the best style of service so you can sit back and enjoy the delicious meal.